It’s hard to imagine someone traveling to Guatemala and leaving unchanged. The mountainous landscape is nothing less than magical, and the people—forty percent indigenous Maya—are cordial and kind-hearted. Guatemala’s beaches might not be anything to sing about, but the country offers many inland attractions, and it’s arguably the most-favored destination of Central America travelers. Guatemala City is one of the most dangerous cities in Central America, and most Guatemala travelers head straight for Antigua. Antigua Guatemala, or Ancient Guatemala, lures the majority of the nation’s travelers each year with its cobbled streets, striking colonial architecture, and the backdrop of smoky volcanoes. Along with Quetzaltenango, or “Xela,” Antigua is one of the most popular Spanish study abroad destinations in the Americas. The colossal Maya ruin of Tikal, located in the northern province of Peten, is another of Guatemala’s biggest draws. The facades of Tikal’s ancient temples are unforgettable, as is the experience of walking from temple to temple through the tangled rainforest—which often echoes with the calls of howler monkeys. The Caribbean coastal town of Livingston is another fun destination, if only for the remarkable rainforest motorboat ride there down the Rio Dulce. 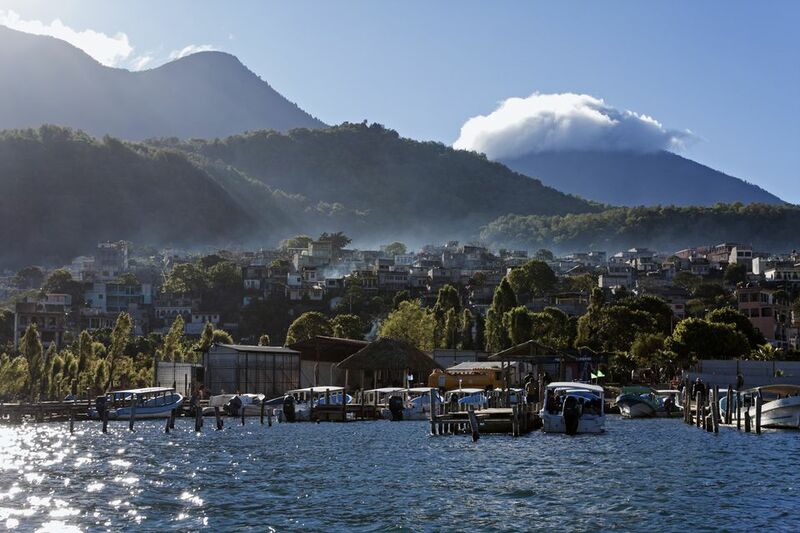 Guatemala’s most stunning natural asset is Lago de Atitlan, Lake Atitlan. Surrounded by misty blue volcanoes, the lake is also ringed by a dozen Maya villages. The most visited are Panajachel, San Pedro la Laguna, and Santiago, all boasting glorious (and distinctive) lake vistas. Be sure to take a day trip to nearby highlands village Chichicastenango during a market day (Thursdays and Sundays). You’ll find the best shopping and street food in all of Central America—just make sure to practice your Guatemalan bargaining skills. Guatemala’s staggering natural beauty is everywhere you look—even around the edges of smog-clogged Guatemala City. The Maya ruins of Tikal are one of the best places to experience Guatemala in all its glory—its temples are set against a background of thick, thriving forest, and spotting huge butterflies, troops of monkeys and other wildlife is commonplace. Some of the country’s best birdwatching, book the motorboat ride between Rio Dulce and Livingston on the Caribbean coast. Impenetrable rainforest towers on both banks and lucky travelers might catch a glimpse of the elusive manatee. For another unique experience, head to Semuc Champey, a limestone bridge over a rushing river, studded with emerald pools you can swim in. Transportation for travelers in Guatemala is dominated by a single, legendary creature: the chicken bus. Chicken buses are claustrophobic, uncomfortable and often stinky. If you never ride in one, you haven’t truly experienced Guatemala travel—plus, they’re dirt-cheap and they go absolutely everywhere you want to go. For long journeys, it’s understandable if you prefer to book a minivan, minibus, or cab. First-class night buses can be reserved for travel between Guatemala City or Antigua and Flores, the gateway to Tikal. Between countries, Ticabus is your best option. If you’re heading to Belize, you can cross the eastern border into San Ignacio, or take a boat to Punta Gorda from Puerto Barrios on the Caribbean coast. Travel in Guatemala is still exceedingly inexpensive. It’s easy to find accommodations with private bathrooms, hot water, and even air-conditioning for less than $10 a night. Of course, touristy cities like Antigua are more expensive. Along with the Quetzal, US Dollars are legal tender in Guatemala, and many ATMs offer both types of bills. Antigua Guatemala's Semana Santa, or Holy Week, is the country’s most colorful fiesta. If you want to visit then, book far in advance. When it rains in Guatemala, it doesn’t just pour. Thunder shatters the sky, the ground turns to muck, and the scenery is obliterated by solid sheets of water. However, even in the rainy season (May through October), rainstorms tend to hit at night and burn off by the morning. Though the lowlands can get pretty steamy, Guatemala’s highlands enjoy a mostly fantastic climate year-round.